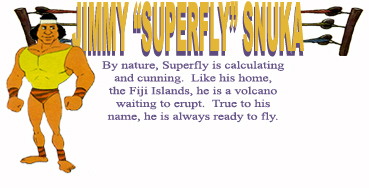 Superfly is the first eraser I ever got. I found him in a box lot of about 50 assorted wrestlers I had bought. So I guess he's the one responsible for me setting out on my mission to complete this set. 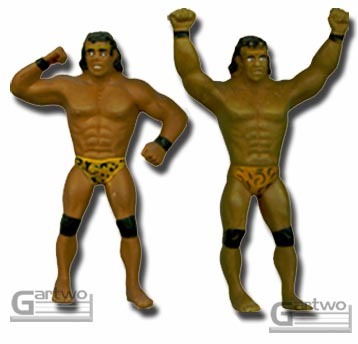 As you can see, there are two versions of Jimmy Snuka. The one with both arms raised up used to be fairly easy to obtain, however it's getting harder and harder. I don't see as many as I used to. MOC nowadays he'll sell in the $15-$30 range. Back when I started collecting these guys I would see Snuka along with Hulk & Sheik just sitting on eBay for a mere $2-$4 each MOC and no one would bid. Unfortunately, ( or fortunately, for the sellers) judging by recent prices, those days are gone now. Now let me tell you about the other Jimmy Snuka figure. You may not realize it, but you're proabably looking at the rarest of all the Rock 'n' Wrestling figures, the Jimmy Snuka one arm down version. At least by my account he's the rarest because the only one i've ever seen is the one I have. I've yet to talk to anyone who has ever seen another one of him. You may have seen a pic of him on other websites, probably courtesy of Big Brother's Figure Museum, but the figure in the Big Brothers pic is my figure; that's the pic from the auction in which I purchased this rare Snuka (along with Piper, Sheik & arms up Hulk...all for only $12!). If you have ever seen another one of these rare Snukas, please email and let me know. Another interresting thing about this Snuka is the fact that he's an exact replica of the Snuka from the 8 inch line of WWF figures made by LJN. Why, I have no clue. As you can see from my Hulk Hogan page, he also has an eraser that looks just like his LJN figure. Maybe Winston Toys & LJN had some sort of working relation to each other? You know, I would really love to talk to somebody from Winston Toys who worked on the Rock 'n' Wrestling figures. If, by any chance anyone out there did, or knows someone who did, please by all means email me.